Need a quick adventure this summer season? Yung swak lang sa budget pero panalo sa experience at memories? Here’s another travel idea for you: The beautiful Bangon and Tarangban falls in Samar! While most people head to the beach, it would be a good idea to go take the road less traveled. In addition, makakatipid ka pa! Most of these summer spots tend to charge a little bit more because of the peak season. So here’s our recommended adventure para mas sulit ang summer mo. Tara na sa Tarangban Falls! Wait, saan yon? Makikita ang Bangon at Tarangban Falls sa lungsod ng Calbayog, Samar. Kilala ang siyudad bilang “City of Falls” dahil sa dami ng mga natural falls na makikita dito. Pinakakilala sa kanila ang Bangon at Tarangban, pero you can actually visit more. Plus, kaya mong puntahan sila almost lahat within the day! But, we have to warn you this early: Napakaganda ng kalikasan sa Samar. Madaling mag-fall sa kagandahan ng mga falls at iba pang natural wonders sa lugar na ito. Thus, if you fall in love with Samar, it will be very hard for you to come home to Manila. So how to get there? First, mag-book ng trip to Calbayog via Bicol Isarog Transport System. Pumunta sa POSIBLE outlet na pinakamalapit sa iyo at mag-book ng biyahe doon. Keep the transaction printout. Next, on the day of your trip, simply go to the ticketing office and exchange it for your seat assignment and boarding pass. Then, sit back and enjoy the ride. Easy lang, di ba? Remember that Samar is a bit farther than Bicol so reserve one whole day for your trip. Huwag masyadong mainip sa biyahe. Bicol Isarog offers travel options like sleeper buses or La-Z-Boy recliners with wifi and charging to make your trip comfortable. Plus, if you’re on a day trip, don’t forget to look out the window! See the sights along the highway. There’s so much that the Philippines has to offer. Mas magandang tumingin sa mga bundok kesa sa mga buildings araw-araw. Once the bus reaches Matnog Port, you will be taking the RORO ferry. The sea crossing takes an hour or so. Afterwards, you get off at Port Allen, Northern Samar, to resume your journey. You’d probably be in Calbayog by day’s end. Nakapagpahinga ka na ba? Tara na sa Tarangban Falls! And of course, Bangon Falls! Get up early and secure a ride to the falls. You get two options here. 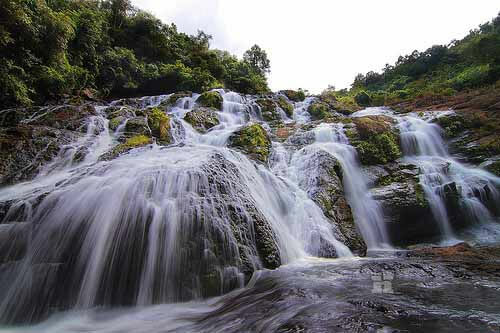 First, most travelers recommend taking on Bangon Falls first because it’s closer to the city. Or, you can go a bit farther to Tarangban and make your way back, passing Bangon Falls along the way. Para sa ilang mga guides, better kung magsimula ka sa Tarangban dahil marami ang bumibisita dito lalo kapag weekends. Atsaka mas madali raw ang daan pabalik ng Bangon kapag dito ka magsimula. Either way, prepare to walk for up to an hour, depending on your fitness level. Tarangban Falls offers a majestic view of cool, clear water cascading over large rocks. Between the two, Tarangban is higher and more immense. Best time to go there, according to the locals, is between 9:00 and 10:00AM, while the crowds aren’t there yet. Bangon, or Bugtong Falls to the locals, on the other hand, presents three tiers of shallow falls cascading into pools deep enough for swimming. Malamig din ang tubig dito. So if you prefer to be here by lunchtime, perfect na perfect para magpahinga at maligo dito. Kung marami ka pang energy, you can choose to hike back and explore the other falls around the city. But if you want to just relax and lounge around, by all means, stay. Take time to enjoy the view, rest, or swim in the cool water. For safety reasons, the falls close around 2:00PM to give time for people to hike back safely. Tandaan lang na huwag mag-iwan ng kalat sa lugar. Do your share and keep the place clean so other people can enjoy the falls, too. End of Day Two: Should I stay or should I go? 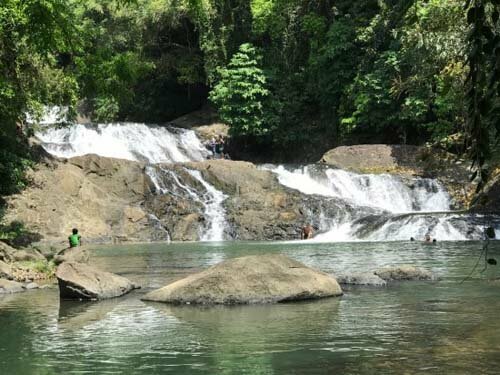 Matapos mag-explore sa Bangon at Tarangban falls, take time to enjoy Calbayog City. Hindi kumpleto ang adventure kapag hindi kumain ng mga local na pagkain. Sumubok ng mga local food at gumawa ng mga memories kasama ang mga mahal mo sa buhay. Afterwards, there’s a hard decision to make: Should you stay, and see more of Samar, or should you go home? Ikaw mag-decide. Sabi naman namin sa iyo, madaling ma-fall sa natural na ganda ng Samar. To know more about exploring Bangon and Tarangban falls, you can check here. To learn how to explore more of Calbayog City, click here. 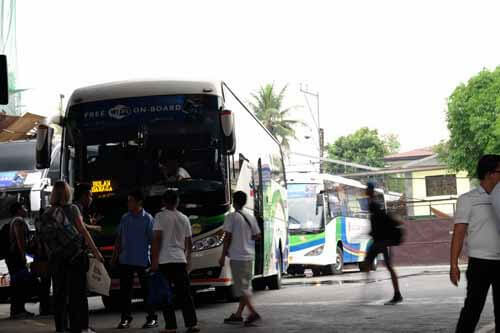 Para naman malaman kung paano maging negosyo ang pag-book sa Bicol Isarog Transport System, mag-click dito.